Space Dragons Dragon Boat Racing Team: Congratulations Biggest Losers! Congratulations to all the Space Dragons Biggest Losers! The official winner of the contest will be announced Saturday morning at the LB tournament ... but early unofficial weigh-in results reflect that the entire field has successfully lost weight! In fact, collectively, you shed the weight of a whole paddler! Hope all of you feel healthier & fitter as a result of the process! The challenge now - maintain the healthy lifestyle practices & keep any unnecessary weight off! 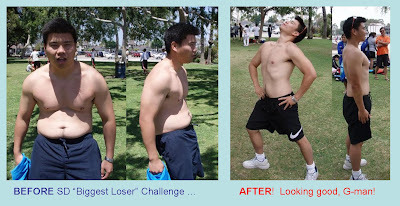 This past Sunday brought the conclusion of the Space Dragons' "Biggest Loser Challenge". No one can deny the impressive results achieved by some of the participants. For various reasons, I did not lose as much weight as I had hoped before the conclusion of the contest. Yes, my waistline is surely shrinking, and I have seen definite gains in my muscles when I look in the mirror, but I will admit that there was room for improvement in my diet. However, I don't see this as defeat. In fact, seeing the results obtained by fellow participants has motivated me even more! Imagine that you are engaged in combat. You and your enemy are at a stalemate--neither side making any gains on the other. Then, you hear that another of your battalions has achieved a major victory and routed the enemy. The effect of this is that it raises your morale and causes you to fight with increased ferocity. We are not competitors, but teammates. The war is not over. For my fellow teammates who continue fighting the battle of the bulge alongside me, press on and keep up the good work! Let's see what we can do by the San Francisco tournament! For those who have achieved your weight loss goals for now, enjoy your accomplishment, but do not relish in it for too long. The toughest battle lies ahead, and that is keeping the weight off. Let's continue our good eating habits and providing positive encouragement to each other. Congratulations, and may we have continued success as a team!